A lot of people are really freaked out about this, including my daughter. 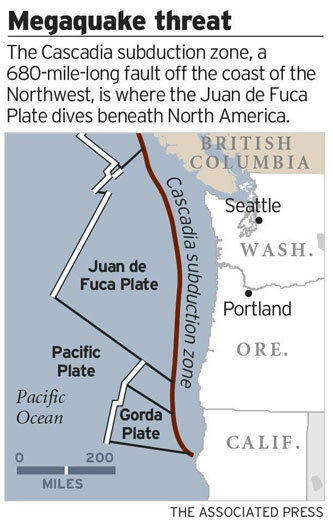 While the overall details of the article are correct – the Cascadia subduction zone is overdue for an earthquake and it will be a big one – the over-sensationalized tone of the story is causing a lot of unnecessary fear around here. It’s okay to make people aware of the dangers so they can be better prepared if/when a natural disaster occurs, but when they talk about how seven million people will be impacted and “that region will suffer the worst natural disaster in the history of North America,” it borders on fear mongering. My coworkers were talking about the wall of water that will inundate the office when Bonneville Dam collapses and the Columbia River overflows but that probably won’t matter because we’ll all be dead anyway, and I couldn’t help but shake my head and tell them to put down the Kool Aid stat. Earthquakes are scary. I get that. But when you are suffering from crippling nightmares and spending hundreds of dollars buying survival gear from Amazon, your paranoia has reached a critical stage. It’s pointless worrying over something we have no control over, anyway. It will happen someday. Maybe tomorrow, maybe 100 years from now. It will be swift and sudden and you’ll be taken completely by surprise. Again, a little knowledge and preparation are good. But you can’t let fear get in the way of your everyday life. I know of what I speak. I was there when The Pretty Big One hit. Loma Prieta. October 17, 1989. I was living in the Bay Area, attending college, working retail, and dating my future (though not permanent) wife. In fact, we were at her dad’s house on that warm early fall evening after classes at San Jose State University earlier in the day. Game 3 of the World Series was taking place, a big deal in Northern California that year as it pitted the rival San Francisco Giants against the Oakland A’s in a “battle of the Bay.” I’d like to say we had the game on – that would have been the “cool” answer – but in reality, the TV was tuned to a Facts of Life rerun and we were just sitting down to an early spaghetti dinner when there was a sharp jolt. The world moved sideways and then all hell broke loose when the shaking got underway. I remember looking at her when it started and laughing nervously, but I made no move to get up because I’d lived there a few years by then and had experienced my fair share of earthquakes. I figured it would be over in a few seconds and then I could get back to my spaghetti. Because the shaking got real intense. Lights were swaying, objects falling over in the china cabinets next to the kitchen table, and the rumbling was growing louder by the second. They say a tornado sounds like a freight train when it strikes. I don’t know about that, but an earthquake sure does. I did what I had been trained to do next – found a doorframe, planted myself beneath it and rode out the quake. I can’t remember exactly how long the shaking lasted, but it felt like about a thousand years. Finally it did stop (though aftershocks continued all night and for the next couple of days) and we made our way to the living room, where the television quickly filled with images of death and destruction. 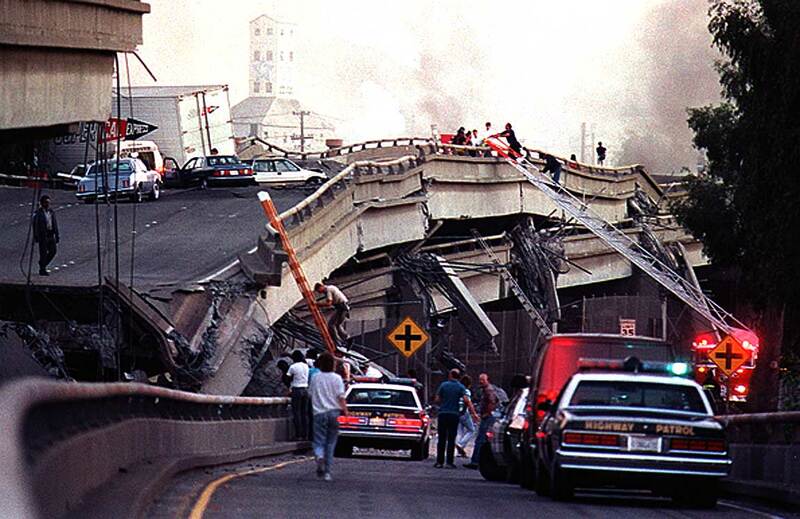 The Cypress Street Viaduct, where a section of the freeway collapsed, crushing cars and killing 41. A brick facade from a high rise that came crashing down onto the street and sidewalk below, killing six. A collapsed section on the upper deck of the San Francisco-Oakland Bay Bridge. Fires. Buildings reduced to piles of rubble. Pandemonium. It was all very sobering, and the next few days were surreal as people tried to go about their lives. Damage in San Jose wasn’t nearly as bad, but classes were cancelled at SJSU for the rest of that week. I was working at a little store in Eastridge Mall that sold luggage at the time, and had a lot of cleaning up to do when I got back to work as nearly everything had fallen off the shelves during the shaking. But that’s minor, compared to the 63 people who ultimately lost their lives in the 6.9 earthquake. Which is why I refuse to devote any extra anxiety to it. There’s only so much planning you can do. 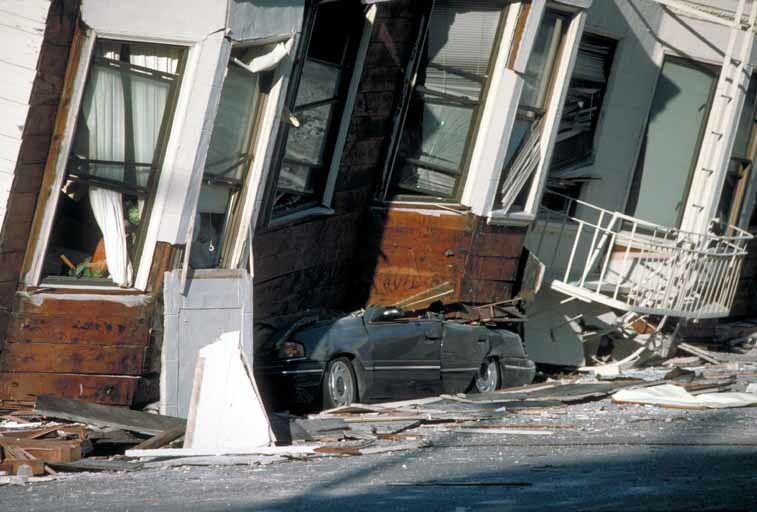 Your pantry might be stocked with four weeks’ worth of bottled water, but what happens if the quake hits when you’re at work? I’m not trying to underplay the threat and am not suggesting you don’t stock up on emergency supplies; I’m just saying don’t let fear keep you up all night long. Which is why we took Audrey to the movies yesterday. The film we saw? San Andreas. Hey, don’t fault us for that. (See what I did there? Earthquake humor!). At its epicenter (again! ), the movie featured a cliched, predictable plot that strained credibility within its first two minutes and characters who were caricatures of other film characters. But the special effects were incredible, and Sia does a really cool version of “California Dreamin'” over the closing credits. It’s the ultimate summer popcorn flick and provided us with a cheap distraction (and more importantly, cold A/C on a wickedly hot summer afternoon). 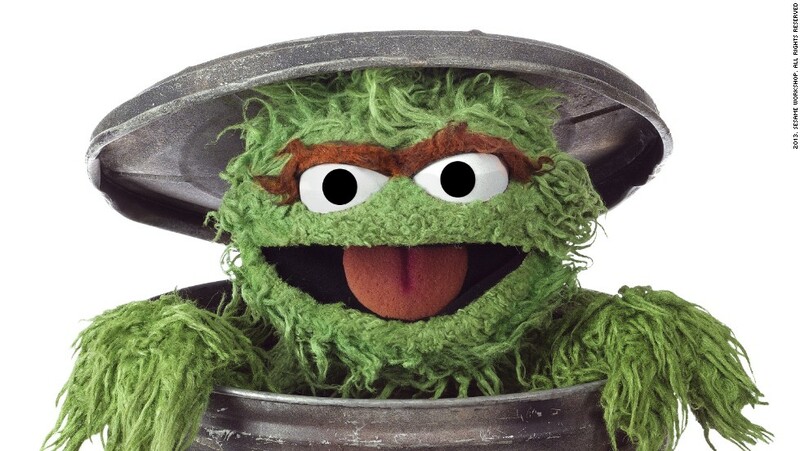 Don’t go in expecting an Oscar. Unless, of course, you’re meeting a friend named Oscar. And if you’re a resident of the Pacific Northwest, please don’t let the article from The New Yorker ruin your day. Mark, this is exactly how it was living in Florida for 20 years and dealing with hurricanes. The news and media would hype it up so much that it freaked people out. I understand that they have to be a little extreme in warning people, just to be on the safe side. However, most of the time they were wrong about the severity of the hurricanes. Like you, I would prepare myself by stocking up on supplies, but I never went overboard because there is only so much you can do to prepare. The one thing about hurricanes though is that you at least get some kind a weather warning that they’re coming. Whereas with an earthquake, they just seem to suddenly happen. Having just moved out to CA a year ago from New England, where the worst weather you get is a blizzard, it has been a bit bizarre dealing with these freak outs. I’ve only felt maybe one earthquake but it wasn’t very big. My boyfriend and I like to think we have a game plan if we are not together when it happens, and a “safe zone” to meet up, but it may not work out that way. But you’re totally right – don’t stress about it. I wasn’t even aware of the dire warnings in your neck of the woods. People freak out over everything. Every time we get a blizzard warning (and that’s like 8 per winter), good luck buying any milk or bread at the store. People start hoarding basic foods. It’s bizarre! The media needs to calm the f down and stop worrying the anxious! Oh, winter storms are another issue entirely! It’s the same out here. They predict an inch or two and people stock up like they’re going to be cut off from civilization for the next week. The media definitely has a role in fueling that particular fear, too! A few of those articles have made their way to the east coast. 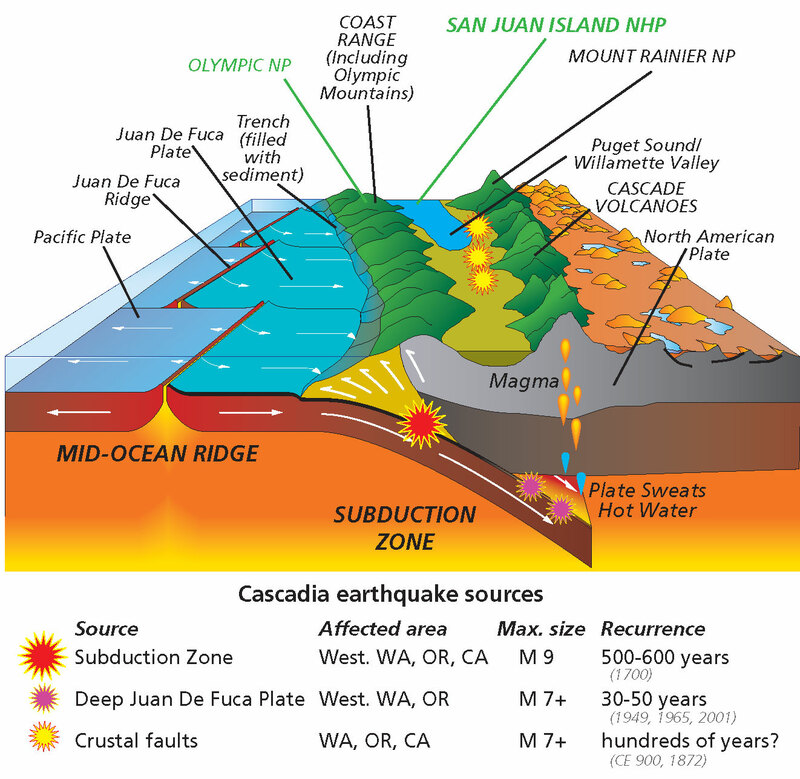 Things like a particular area of a fault line has an event every 140 years meaning it could happen again any day now. If it makes you feel better, a portion of the Canary Islands is supposedly going to sheer off any day now triggering a tsunami which will make my house beach front property – so that’s exciting. The optimist in me likes to think that will make the value of your property skyrocket! I read that article and thought to myself, well I am glad I don’t live up there anymore. I will take a tornado any day of the week. I know, rude of me. But having been through earthquakes, hurricanes, tornadoes and blizzards I choose tornadoes or hurricanes. Weird? Maybe. I was up in Seattle for the really bad snow way back in 1985, that was the year I said enough and I am going home, hightailing it back to Texas where the worst we have is tornadoes, hurricanes, golf ball sized hail (depending on what part of the state you live in). You are right, you can’t predict or entirely plan. Freaking out about maybe is ridiculous. I can see where it would be for a nine year old. Is That Sriracha in Your Pocket, or Are You Happy to See Me?